We who love to travel, would never cancel a trip. But sometimes life just intervenes. I remember I had to cancel my trip to Bhutan because of a minor surgery of my husband. How I wish Uncancel by Make My Trip was around at that point of time! I got to know about it recently from a company communication! I did Go to Bhutan Later! At MakeMyTrip, we understand that no one WANTS to cancel a pre-planned trip, but more often than not, due to unforeseen events, people HAVE to cancel their trips. That’s why MakeMyTrip presents UNCANCEL. By opting for Uncancel, customers need not cancel their travel plans, when faced with a last-minute spoiler! They can simply push their travel dates to a later date. However, the beauty is this… You travel later, but you pay nothing more than what you paid initially. In essence, Uncancel protects you from travel price hikes. I also have a dear didi (my sister’s classmate) who had to cancel a really expensive trip recently due to some change in her daughter’s exam date. She actually lost a lot of money in the process, now I only wish if there was an uncancel for her! Of course none of us wish to cancel a trip but for those times when we have no option I think uncancel would be a great idea. But this is one idea I do not wish to personally experience anytime soon! I have stayed at many beautiful hotels this year and I have hardly written about any of them! It is time to set it right and I start with the beautiful Terma Linca Resort, Thimphu. What blew me completely away was its location! 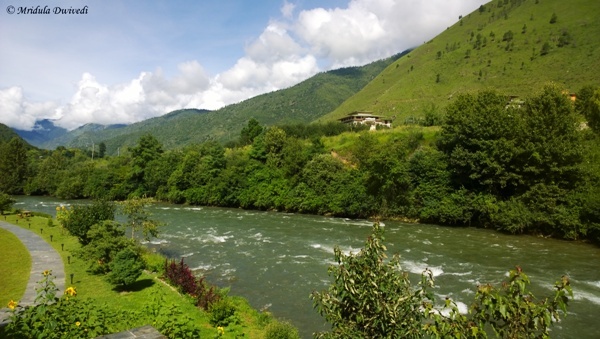 It is right next to the Thimphu River. The small concrete path that you see in this picture is part of the Terma Linca Resort. It is this close to Thimphu River. I managed to walk twice along this path and enjoy the serene atmosphere by the river. I had this huge room to myself. 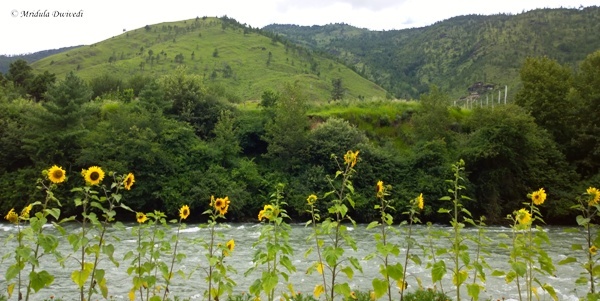 From the window I could see tall sunflowers and the Thimphu River. It was a comfortable room, with good supply of tea and coffee. The bathroom had a bath tub as well. By my standards this was surely a five star property but the actual rating is four star as it does not have a swimming pool. But then in Bhutan the weather is not too conducive to having a swimming pool. 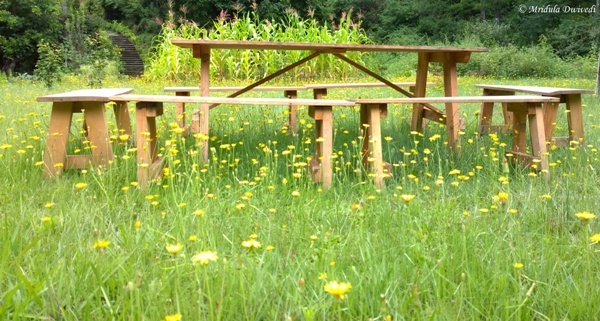 My walks took me to the edge of the resort and I found this beautiful nook which was running amok with yellow wild flowers. How I wanted to have a meal on these benches but I never found time! 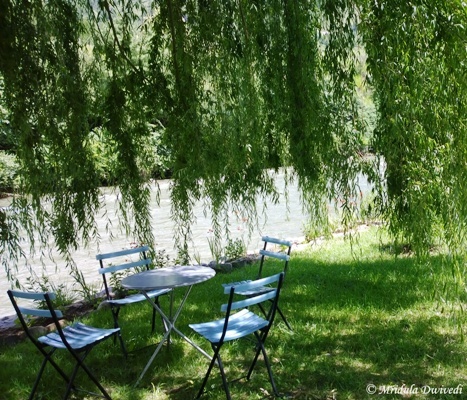 There was a huge weeping willow tree in the premises and they set cozy table in the hollow of it. This was my absolute favorite corner in the entire hotel. How I wish I at least managed a cup of coffee along with a book here. I did sit down quietly on one of the chairs for a few minutes before I was required elsewhere! This is the close up of the view from my room and it was absolutely gorgeous! There was a bench in front of this spot too. I did manage to sit here for a while and just listen to the river flowing by. Terma Linca is a gorgeous property and if you are looking for a hotel away from the city, look no further! 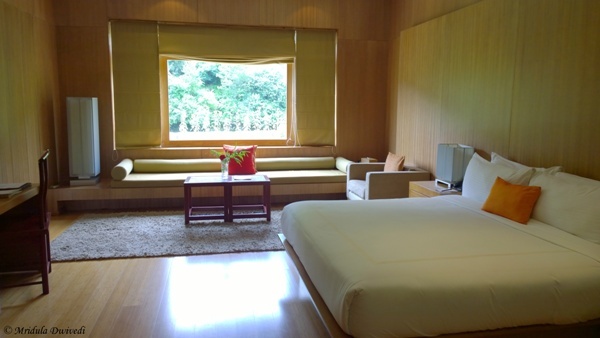 Terma Linca Resort is part of the Makemytrip’s Premium Bhutan Package. I was invited by Makemytrip to Bhutan. It is time to head out to Hong Kong with children, my daughter and my niece (my sister’s daughter), better known as Brat 3 and Brat 4. Brat 4 is my daughter by the way, she is the youngest of the lot. If you are wondering about Brat 1 and 2, they are my nephews and this brattiness is assigned simply in a chronological order! 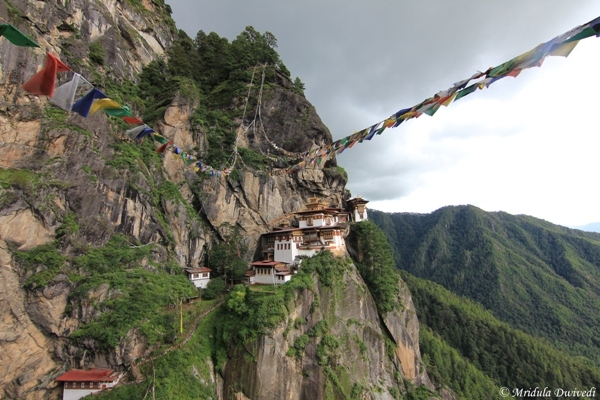 This is a personal trip that I booked with Make My Trip long before they invited me for Bhutan. With two young kids (brats actually) I chickened out and did a package! Everyone else in the family is wise, they simply stayed away from handling the two packets of dynamites but what to do … meine tou aab okhli mein sir daal diya hai …. Hong Kong was the destination of choice because of the Disneyland and the age of the kids! I hope traveling will not turn them simply into bigger brats! It was a particular type of war this time, I could not even blog for a few days before leaving the station, I had so much work to finish. Then as usual the packing is not complete but this time my sister offered that she will complete my packing. Now that is why sisters are priceless! I have never felt more uncertain before the start of a trip, I mean traveling with two kids is no joke. I hope they will not turn all my hairs grey! Depending on the outcome of this trip, I may plan to travel more with both the brats! Now that has to be offered as a carrot to them, that and keeping their stomachs full all the time. I am sure both of them would like to have the window seat. If they fight too much, I will simply take the window seat! On that note I close this post. And I promise that once I come back there will be a lot of updates from my three recent trips, Thailand, Bhutan and of course Hong Kong.